I'm confused because I just read an 'opinion' piece in an Australian newspaper that has me outraged and thinking that I have traveled in some sort of time machine backwards about 40 years. Or more. You may have heard that Australia's Prime Minister, Julia Gillard, had her say in parliament this week and called out the leader of the Opposition for his sexist behavior, labeling him a misogynist. That this speech was made in the context of a messy political environment (that I don't think anyone in politics comes out from looking good) - has divided Australians on the speech. Internationally, however, without the political context, it has been met with a number of favorable comments. But forget Julia Gillard, the speech and the double standards of politics. "Playing the gender card is the pathetic last refuge of incompetents and everyone in the real world knows it. It offends the Australian notion of the fair go"
No one has the right to stand up for themselves because of gender or any other bias? You only do it when you are incompetent and have no other card to play? Really? It's not okay to say something when you are being paid less than your male counterpart with equal experience or are excluded from discussions? The appropriate response to ribald jokes and sexist comments is to grit your teeth with a smile and keep working? Turn the other cheek? "For instance, voice is important to demonstrate authority. Men with a booming baritone command attention. Height is another issue. Men are usually taller than women, and height generally correlates with high office." "The dearth of women in high places is not because of sexism any more than it is because they lack talent." The empirical evidence is overwhelmingly that women perform equally well in business. And in fact Catalyst has published reports that companies with higher female representation on boards outperform on the measures of return on equity, return on sales and return on invested capital. A Mckinsey study "Women Matter" found that of the 89 European companies with the highest level of gender diversity in their top management positions - they outperformed their sector on return on equity, operating result and stock price growth. Lack talent? Bah humbug! I would continue but I want to get this off my chest and go back to enjoying my Sunday! Look there has been a lot of balanced commentary, and the same newspaper that ran this piece also had an article "Evidence sexism is rife in Australian workplaces is the small number of female CEOs" which included a quote by Helen Conway, the director of the Equal Opportunity for Women in the Workplace Agency that "The focus should be on gender equality and making it normal for men and women." Hurrah! I might not have a booming baritone - but I do have a voice. And I just want to say that I don't think anyone being sexist is funny (or clever). It's ironic as just this morning (before my coffee and astonished newspaper reading) I was considering whether I should move my career blogging to a more 'gender-neutral' site. Because I am passionate that everyone who wants to pursue a career should have access to information to develop their skills to be able realize their potential. And it takes a brave guy to hang around a site called Career Chick Chat for information! But this article changed my mind. Women need a voice. A place to learn the skills. I'm staying here and everyone is welcome to visit. P.S. You can read the article I refer to here...but spoiler alert...it might make you cross! I'm right behind you Karen. Sexism is not funny or clever. I would ask you give a little grace to the average guy, though, who commits many small sexist transgressions without being aware of it and would be happy to be gently corrected. Let's all make sexism a non-issue together without labelling villains and enemies. Keep up the good work pointing out the sexist acts that we all need to learn are not ok.
Stu - great point! 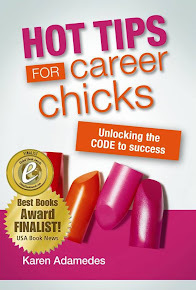 Happily corrected as there are a lot of guys who read Career Chick Chat!